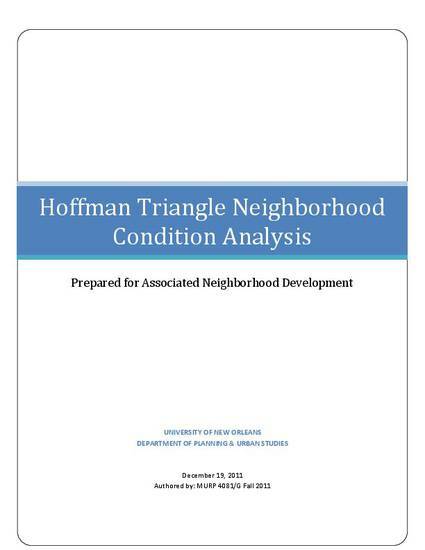 In the Fall of 2011, University of New Orleans (UNO) students enrolled in the MURP 4081/G ― Information Technology for the Planning Profession – led by Dr. Michelle Thompson, partnered with the Associated Neighborhood Development (AND) to evaluate quality of life indicators within Hoffman Triangle. Hoffman Triangle is a neighborhood located in the Central City of New Orleans, LA. The student teams evaluated the neighborhood parcel by parcel, collected primary and secondary information and analyzed data using basic data and spatial analysis primarily within a geographic information system (GIS). Specifically, primary data collection included a parcel condition survey, a commercial property inventory, a property image database, streetlight locating, and identification of tires and trash dumping sites. Secondary data, for Hoffman Triangle only, included US Census 2010 demographics, City of New Orleans property assessments, blight and crimes, as well as, the WhoData.org March 2011 Hoffman Triangle survey. The goal of this project and of the client, AND, is to update and expand data for advocating purposes, increase opportunities for community and economic development, as well as provide the City of New Orleans with a neighborhood profile which informs their placed-based strategies. AND remains committed to revive the Hoffman Triangle neighborhood by increasing homeownership and to identify vacant and substandard properties for targeted revitalization, thereby improving the quality of the neighborhood and residents’ lives.